For hyperthermia to reach the status of an accepted modality, 41 unequivocal proof that it is effective must be obtained. A clear, causal relationship must be demonstrated between the application of the modality and the response of the disease. A thorough understanding of the equipment is required to demonstrate such a relationship. Further, to maximize the possibility that patients treated with the equipment receive the desired effect, the equipment should conform to certain minimum standards. Equipment for hyperthermia should heat human tissue in a controlled, safe, and reproducible fashion. All ancillary equipment should operate as intended, without serious risk of failure or injury to the patient or operator. Several parameters which indicate the effect of the treatment should be monitored with suitable accuracy. 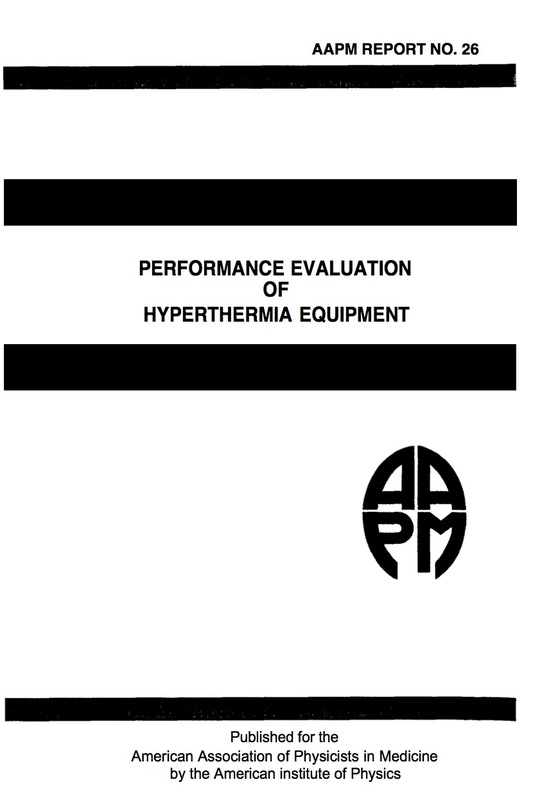 This document has been prepared as a guide to assessing the performance of hyperthermia equipment. The procedures described are felt to constitute the minimum necessary for adequate evaluation of each piece of equipment. These recommendations may be utilized for developing purchase specifications; should be considered for acceptance testing of new equipment; and should be incorporated into a quality assurance program. Performance criteria expressed here are considered the minimum acceptable for a clinical system. As is true of many newly-introduced modalities, hyperthermia equipment and procedures undergo frequent modification. Revisions of this document will be prepared when necessary.